Remember jumping on a trampoline as a kid? You were so busy having fun you didn’t even realize you were exercising. As an adult, you can enjoy that same fun experience, but in your home – and on a mini trampoline. Adult trampolines are designed for exercise, and are small enough to fit in any home. But just like with a full-size trampoline, quality and safety are the two most important things. Weight Capacity: When buying a mini trampoline, weight capacity is one of the most important things to consider. Some models have a higher maximum weight than others, and you’ll need to find a model that can accommodate both you and any other user that may be using the trampoline. The maximum weight capacity should be listed in the product description. Size: Most mini trampolines are around the same size, but you’ll find some models with a larger or smaller jumping surface. The standard size is 36” in diameter, but you may need more or less space. Check the product description for the trampoline’s dimensions. Bounce: The quality of the trampoline’s bounce is dependent on the spring design. Some models use bands, while others have coils or springs. Look for models with wider bands or more springs for a stable, quiet, and safe bounce. Quality should be the most important thing you consider. A poorly made trampoline can result in injury – and wasted money. Stamina 36-Inch Folding Trampoline – From a trusted name in the fitness industry, the Stamina 36” folding trampoline provides a safe and effective way to get in a great cardio workout. And when you’re done with your routine, you can fold up this trampoline, and store it away until next time. With a weight of just 14 pounds, this model is lightweight and easily transportable. It also has a maximum weight capacity of 250 pounds, so it can accommodate most users with ease. The all-steel frame is durable and sturdy, while the thirty-band tension resistance offers a great bounce. With a high weight capacity, durable design and easy portability, this is the ideal adult trampoline for just about anyone. MaXimus Pro Quarter Mini Trampoline – If you want to take your workouts to the next level, the MaXimus Pro mini trampoline is a great option. This model comes with a stability bar and extra accessories to help you get into shape. The Pro mini trampoline folds up when you’re not using it, and is easily transportable. It even comes with a carrying bag. Along with the trampoline itself, you also get a stability bar, sand weights, resistance bands, and a DVD. The DVD includes three workouts: beginner, intermediate and advanced. It also has bonus stretch and core workouts. The MaXimus Pro has a weight limit of 300 pounds, and features giant coiled springs for a superior bounce. Merax 36″ Kid’s Mini Trampoline – Don’t let the name of this trampoline fool you – adults can use it, too. While designed for kids, this trampoline has a 180-pound weight limit. It comes with a full gripped stability bar, too, which makes it ideal for users who are injured or need a little extra stability. The handlebar can also be removed for added convenience. The 36” jumping surface provides just the right amount of space for rebounding, and the metal springs offer added durability. If you have children and want a trampoline that can be used by all members of the family, the Merax 36” model is a smart choice. Upper Bounce Mini Trampoline – Upper Bounce’s mini trampoline is foldable and transportable, so you can take your rebounding workouts wherever you go. Complete with a storage bag, this model comes with everything you need to get a great cardio workout. A 36” diameter jumping mat provides ample space for jumping, and the springs connect set-wise to deliver a big bounce. The mat is also constructed with durable PP mesh material. The frame is made of galvanized, powder-coated steel that’s rust-resistant and highly durable. With a maximum weight limit of 220 pounds, this trampoline is a great option for anyone who needs a higher weight limit or a transportable trampoline. Ancheer Foldable Trampoline – The Ancheer foldable trampoline is larger than most other rebounders, which makes it a great option for anyone who wants a little more jumping space. Offering a 38” jumping surface and 220-pound weight limit, this model can accommodate most users. The Ancheer trampoline can be folded four times for maximum portability and easy storage. It’s easy to assemble, too, and no tools are required. Offering 2mm pipe thickness and a grip hook design for the springs, this trampoline was designed with safety in mind. And the high elasticity PP mats will provide you with years of use. 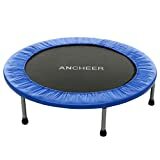 Ideal for users of all ages, the Ancheer personal trampoline will whip you into shape in no time. Trampolines are a great way to get the exercise you need without having to pay for an expensive gym membership. But finding the right indoor trampoline isn’t always easy. Low-priced models may be attractive, but they often wind up falling apart after just a few months of use – a serious safety hazard. Foldable Design: Does the trampoline have a foldable design? Most indoor models do, which means you can store it away in between workout sessions. You can also take your trampoline with you on the go if you want. While not an absolute necessity, a folding design is a definite perk. Frame Design: Another thing to consider is the design of the frame. Galvanized steel is ideal because it offers rust resistance, but if you only plan to use the trampoline indoors, this may not be much of a concern. Steel in general is a durable material that makes for a sturdy and strong trampoline frame. Extra Accessories: Some rebounders come with extra accessories that can make your workouts even more intense. The MaXimus Pro, for example, comes with sand weights, resistance bands and a workout DVD. While not a necessity, these extras are great for those who want to really boost their strength and endurance while rebounding. Price: The cost of the trampoline is another important consideration. Fortunately, most rebounders are affordable, but it’s still important to figure out how much you can realistically spend. Of course, you should always opt for quality over price. Cheaply-made trampolines can be a safety hazard.